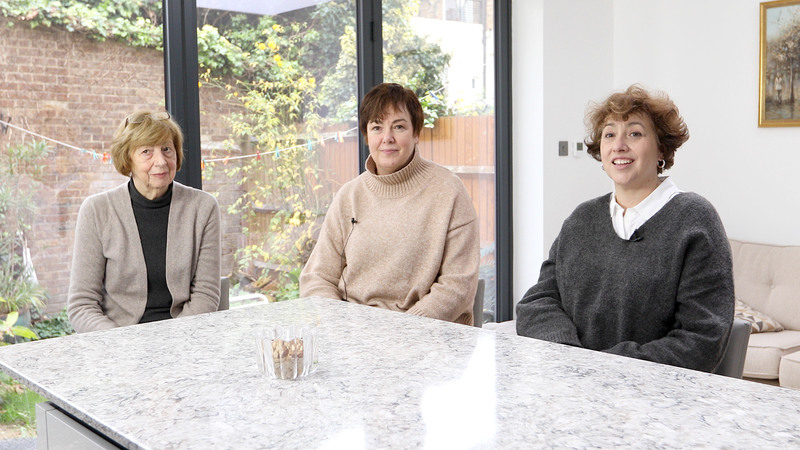 Looking to add a clean and contemporary look to your breakfast bar with minimal effort? 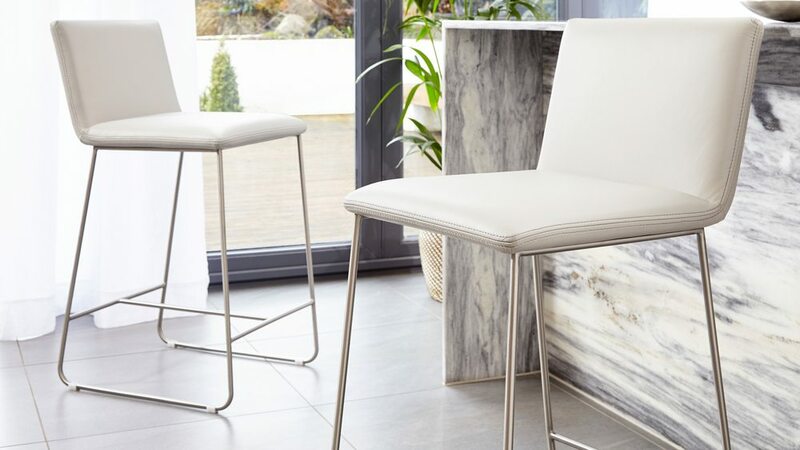 The Tia Real Leather Bar Stool might just be what you're after! Simple in shape and design, the Tia will instantly update your kitchen or dining space. The real leather upholstered seat and backrest offer plenty of comfort while the trendy curved brushed metal base adds a modern flair. 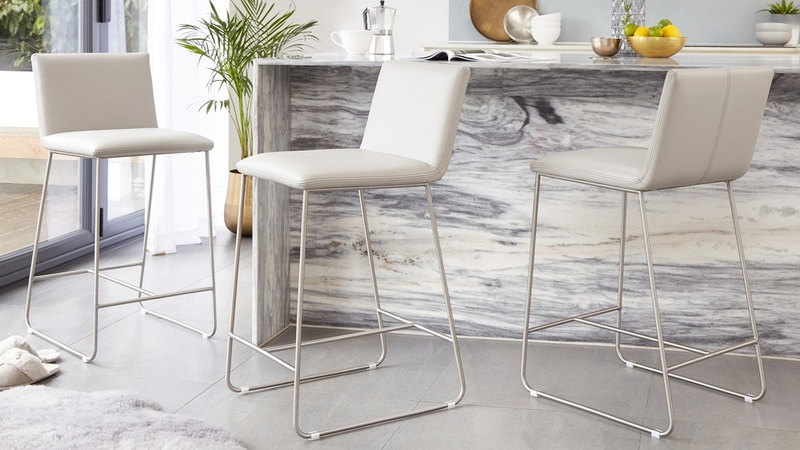 Cool, comfy and practical, the Tia bar stool is a must have if you're looking for a stylish bar stool for your home. The Tia bar stool measures 67 cm tall, making this a counter height seat. A fixed height bar stool with four legs means the weight is distributed across a greater area rather than at one central point, offering plenty of comfort and support when seated. 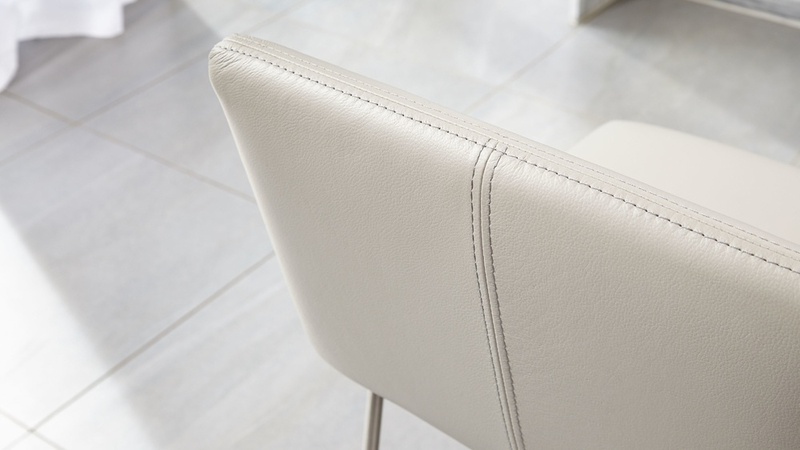 The seat of the Tia bar stool is upholstered in a premium real leather. This offers you a consistent colour and finish that really perfects the modern look of these stools. 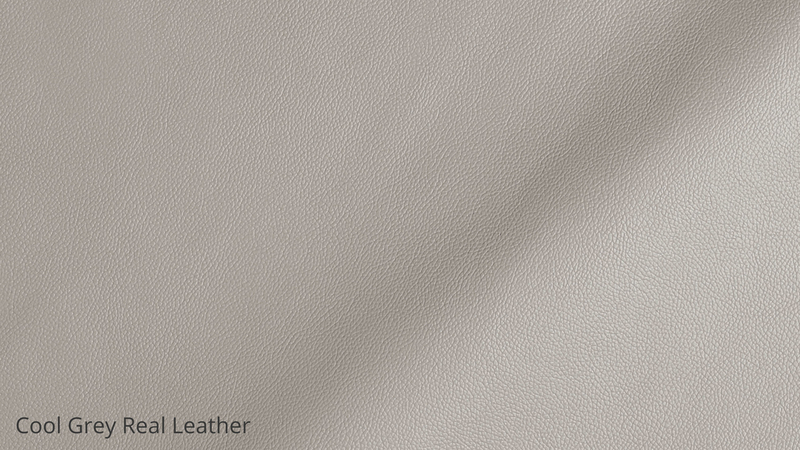 Real leather effortlessly radiates a feeling of luxurious comfort, while also being incredibly durable. The slim, wraped style seat and neat stitching detail are a subtle but sleek way to update your space while the low back offers that extra bit of lumber support when seated. 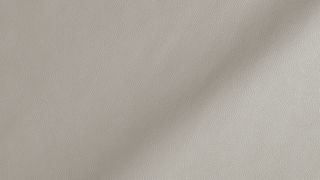 Brushed stainless steel is easy to maintain, won't show up dust and fingerprints and is good for tying in with kitchen finishes as they often have stainless steel trims. This makes the Tia stool practical, good-looking and easy to style within your existing space. The footrest at the base of this modern bar stool has been welded to the frame for extra strength and durability. This provides a step up onto the stool and also a place to rest your feet when seated. 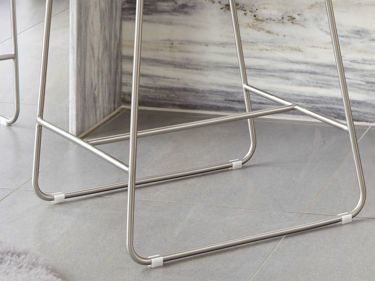 The semi-opaque floor glides are designed to keep the stool steady and protect your flooring. They'll also help to minimize drag noise, an important feature when you consider how often bar stools are pulled in and out! We also have the Monti Real Leather Bar Stool which has a slightly more angular shape. 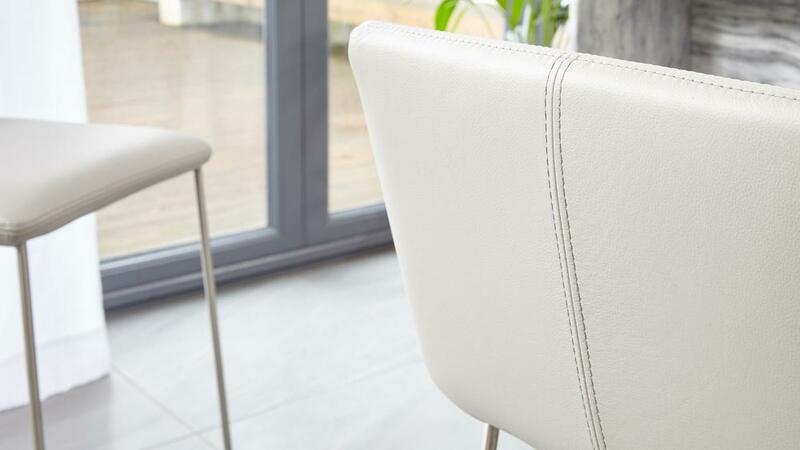 Style the Tia with a piece like the Deco Real Leather Dining Chair for a clean and coordinated look. 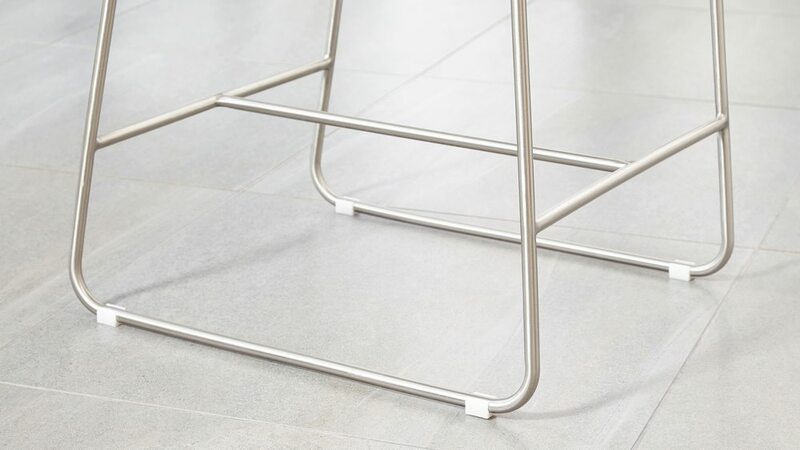 The Tia Bar Stool is all about clean lines and contemporary finishes. You'll have no trouble styling this stylish stool around your breakfast bar or in your dining space, providing a comfy place to sit! Aside from its good looks, the Tia bar stool has also been engineered for strength and durability. For example, the handy footrest towards the base of the stool has been welded to the frame, rather than being attached by nuts and bolts. This not only makes it more durable, but it also gives the brushed metal frame even more of a sleek a fluid shape. The footrest provides a step up onto the stool and also a place to rest your feet when seated.